I was driving to the hospital yesterday when my phone rang. Mike was on the other end. Mike: Hi! So…um…where are you right now? Me: About seven minutes away! Almost there! …why? Mike: Well, I was feeding Maddie, and the next thing I knew, she had pooped all over me! Mike: So I’m just sitting here in a towel and I need you to get me some clothes from home!!! Me: You’re sitting there just in a towel? In her room? Did you ask the nurse for scrubs? Mike: NO! I’m hiding from the nurses in the bathroom and none of them have come in yet!!! There’s POOP EVERYWHERE!!! HURRY!!!! By the time I got there, a nurse had given him a pair of scrubs. He saved his pants and hoodie for me to see, and I think there was a pound of poop on his crotch. It was pretty gross. The antibiotic Maddie is taking gives her runny stool. Now when we hold her we wrap a burp rag around her bottom! My mom stayed with Maddie and me last night (she stayed with me most nights and Mike and I are soooo grateful for all her help). I woke up at 3 am to, “Heather! 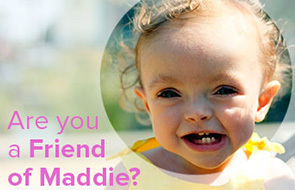 Maddie has been off the oxygen for an hour!” I jumped up, thinking that she had pulled her cannula out of her nose. Then I almost fainted because I got up too fast, which is always a delightful feeling. Once I got my bearings, I realized my mom meant that the nurse had turned her oxygen OFF. Maddie’s saturation was right at 100 on only 1/4 liter of oxygen, so her nurse decided to try her on nothing. When she was off, her sat level was anywhere from 88 – 100. When it dropped to 88, she pulled it back up into the 90’s herself within a minute. At 4:30 am her nurse removed her cannula all together. Maddie barely stirred as the tape was being pulled from her face. She was too tired. When her Pediatrician came in at 7:30, she said, “Maddie is doing better than I could have hoped!” She didn’t think she’d be off the oxygen until the weekend. She examined her and then said, “okay! She can go home!” We were thrilled!!! We then started gathering our stuff. I’d been sleeping there for two weeks so I had a ton of my own stuff, let alone Maddie’s stuff, some of Mike’s stuff, and some of my mom’s. Nothing is ever quick, though. After the Pediatrician decided she could be discharged, all the residents had to troop through and examine her, and the nurses, and the respiratory therapists. Not to mention the paperwork. 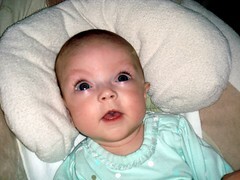 Then, we had to go over all her medications and new breathing treatments. Finally, everyone had looked at her, the medications and treatments were set, the paperwork was done, and we could go! We said goodbye to all the wonderful nurses who took care of Maddie and then we blew that joint so fast there were cut outs of our bodies in the walls. It’s so nice to be home. Maddie immediately settled back into her usual routine of playing, swinging, and eating. When she napped, it was so glorious to lay on the couch! I’m so looking forward to climbing into my big, wonderful bed in a little while. Just as soon as this munchkin goes to sleep. Right now I’m too busy hugging her and kissing her tape-free cheeks. In other really awesome news, my best friend Tara had a baby boy yesterday! Tara and I have been friends since we were two years old. We always planned on having babies at the same time so they would grow up as best friends, like we did. Mike always thought that was funny, but he clearly underestimated us. We are meticulous planners! Which is funny, because it sounds like we had such an easy time of getting pregnant. We like to tell our husbands that Maddie and her son are going to grow up and get married, simply because it freaks both of them out. In all actuality, they are going to grow up like brother and sister, which is exactly what we want. I’m so happy for Tara and her husband (and big sister Reilly! )…Tara and I both worked pretty hard for these babies and it’s amazing that we now have full arms and hearts. That’s great that you’re home! Enjoy some quiet time! I don’t even know you, Mike or Maddie but my eyes are all watery & red… I am so excited for you!! Enjoy your little princess @ home!! Keep us posted !!! omg she’s home!!!!!!!!! !1 I am soooo glad to read that post- I knew she would be home soon. So glad for all of you, you have no idea! now the little girl can focus on growing and playing! i know how overjoyed you are! go maddie!